Oracle believes the current enterprise cloud wars are being fought at the application or SaaS level. This is an arguable position given that some commentators believe that Amazon dominates the cloud world by some orders of magnitude. More on that in a later story but for now I’m concentrating upon the momentum Oracle is gaining based upon the presentations we saw at Oracle Cloud World last week. 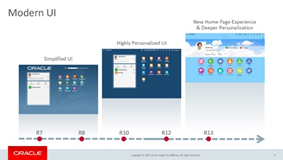 Oracle’s SaaS journey is now more than 10 years old. If that seems like a lifetime then you’d not be wrong but it gives an indication of just how hard it is to build well formed enterprise class applications. For its part, Oracle has faced numerous challenges but from what we saw and heard from customers, it is well on the road to fueling the all important pipeline that replaces the on-premises revenue with cloud subscriptions. This is far from trivial. Mark Hurd, co-CEO Oracle pegs the company’s SaaS revenue at 95% of all cloud revenue. As we have come to expect, Steve Miranda, EVP Application Development at Oracle was bubbly and confident, bringing on customers who spoke freely about their experience, detailing developments and discussing the momentum behind Oracle SaaS apps. Read the complete article here.